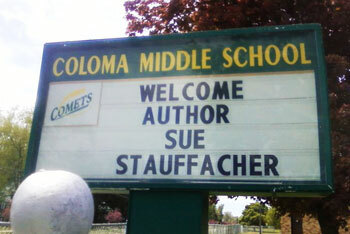 Sue Will Inspire Your Students to Read and Write! Visits from an author should have an air of excitement about them. Sue believes strongly in the importance of ‘edu-tainment.’ She delivers high-quality educational content about writing, revising, creating and developing ideas that key into your core curriculum standards; and she does this by drawing from more than a dozen highly visual PowerPoint presentations that take kids ‘behind the scenes.’ Sue’s a good storyteller, and kids enjoy themselves while learning about the process of creating a book and seeing that process unfold on the screen. Every one of her presentations is different, depending on the students: their ages, their interests, and their needs. The Cooperative Children’s Book Center at the University of Wisconsin has an excellent tip sheet about author visits. In addition to traveling expenses and lodging, Sue charges $1,000 a day for a full school day visit (up to four presentations) and $500 for half a day (up to two presentations). She doesn’t travel out of town for a half day, so if you’re more than an hour’s drive from Grand Rapids, MI and you’re just interested in a half day, you will need to pair up with another school who will host her for the second half of the day. Sue devotes a great deal of her volunteer time to working with and on behalf of children at risk. 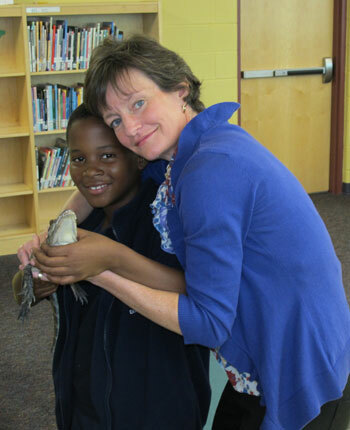 School visits are a way for her to underwrite that work, and she deeply appreciates the opportunity.